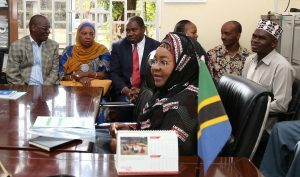 (Ifakara) Former First Lady Salma Kikwete is among parliamentarians visiting Ifakara Health Institute (IHI) offices in Ifakara Town today. The tour has been organized as part of implementation of IHI’s number one strategic objective for the period of 2018-2023: strengthen engagement with key stakeholders. The Parliamentary Committee on HIV/Aids Affairs and Drug Abuse under the chairmanship of Oscar Mukasa is in Ifakara Town for three days (September 7-9) to learn how IHI has contributed to the improvement of people’s health.